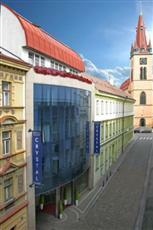 Modern hotel situated in a quiet side lane right in the heart of Prague, only few steps from the Wenceslas Square. Thanks to its convenient location, hotel is preferred by both congress and business clientele as well as tourists. New well-equipped conference hall for up to 60 persons is is suitable for holding small conferences as well as for other social gatherings. Garage parking is available in the hotel basement. Included in your stay, we offer relaxation in relax center with sauna. All rooms are equipped with free Internet access.